The Trustees are very pleased to announce that they will continue to support the part-time position of a speech and language therapist for The Tavistock Centre for Aphasia, Newcastle University. This funding has been agreed from 1st September 2019 for another 2 years. If you would like more information about The Tavistock Centre for Aphasia please visit their website here. The Trustees would like congratulate Julie on her impressive achievement and to thank her very much for her remarkable fundraising efforts which to date has raised over £3800 (with gift aid). On 20th October 2008, Julie suffered a stroke and remembers trying to say something and nothing coming out. A neurologist diagnosed aphasia and so began the hard work with her speech and language therapist. 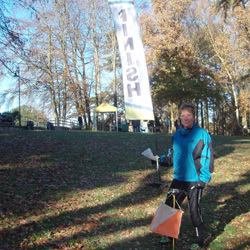 To celebrate her recovery, and raise awareness of aphasia Julie undertook a series of orienteering challenges, (she was previously an Irish World Championship team member) asking for sponsorship for each control flag she found. 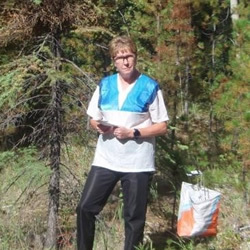 Julie visited 120 orienteering controls which reflected 1 for every month in the 10 years since her stroke. If you would like to support Julie’s fundraising please click here. 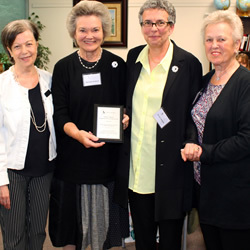 The Trustees of The Tavistock Trust for Aphasia are delighted to have been presented with The Gerry Cormier Communicative Access Award for 2018, by the Aphasia Institute in Toronto. This Award is given in recognition of outstanding contributions to reducing barriers to full life participation for those living with aphasia. “Today we would like to acknowledge and honour the contribution they [the TTA] are making to the lives of people with aphasia and their families all over the world”, Aura Kagan, Director of the Aphasia Institute, Toronto. The Aphasia Institute is a Canadian community-based centre of excellence that has had probably the greatest influence in how the best aphasia centres operate the world over. It has pioneered programmes and practices that help people with aphasia learn how to communicate in new ways and begin to navigate their own lives again. Through direct service, research, education and training, the Aphasia Institute has built an international reputation as a world leader and educator in aphasia. Speechless available via the Wellcome Trust website, is a documentary that tells the stories of two men, Junior Agogo and Barry, who can no longer use speech after suffering strokes. Much of the film is made in the Neurorehabilitation Unit of the National Hospital for Neurology and Neurosurgery in London’s Queen Square. The Trustees of The Tavistock Trust for Aphasia [TTA] are pleased to announce that specially designed badges have been created for all recipients of The Tavistock Trust for Aphasia Student Prizes. The Student Prizes are now awarded at all universities who teach speech and language therapy in the UK, New Zealand, Australia, Canada and Ireland. The Trustees would like to invite all past student prize winners to get in touch with the TTA, so that a badge can be mailed to you. If you are a past winner, please could you get in touch with the TTA via email TTA@tavistocktrustaphasia.org; please include a current postal address. We look forward to hearing from you.